Study astronomy with this fascinating week-long space theme! All you have to do is pick your favorite books, select a couple educational activities, and enjoy a fun week exploring the universe and solar system with your kids! You can read a different book each day of the week, Monday through Friday. Or read your favorite book (s) every day of the week. Kids love repetition, so don’t worry about boring them! Study the alphabet with these Outer Space Color by Letter Worksheets! Your older kids will love reading these Free Printable Outer Space Jokes! 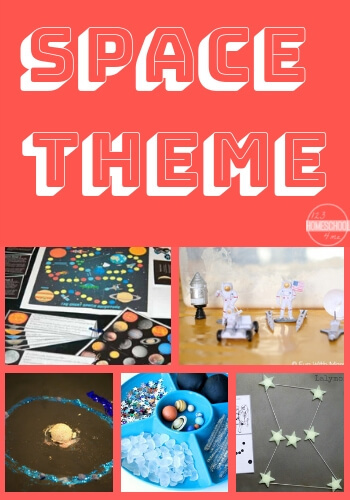 Start with this fun Solar System Learning Pack! Your kids will love making a DIY space telescope! And be sure to check out these 24 moon crafts and activities for more awesome ideas! Begin with the Moon Phases Learning Craft for Kids! And encourage your older kids to start a moon journal! Space Social Studies and Fun! And remember to head outside one night to observe the stars! Don’t miss our other free weekly themes for preschool, kindergarten, and elementary age kids!